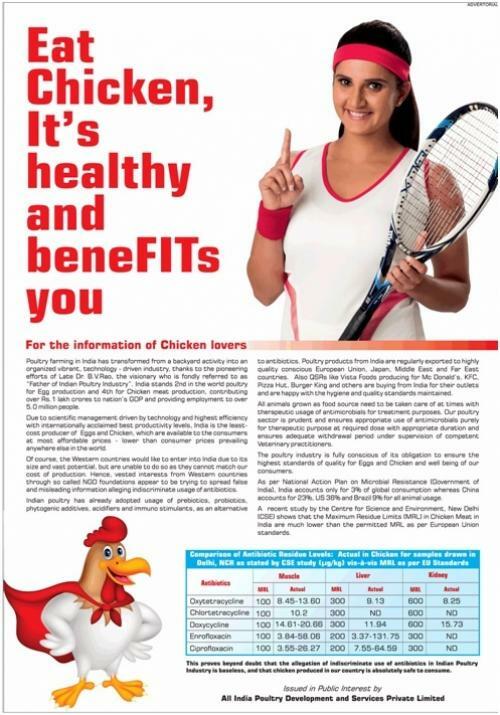 After the study conducted by the Centre for Science and Environment on antibiotic residues in poultry meat was misrepresented in an advertisement published in a newspaper on February 27, the Advertising Standards Council of India (ASCI) has advised the All India Poultry Development and Services Private Limited (AIPDSPL) to withdraw or to modify the ad. The advertisement has misquoted a 2014 study as it was not to find out the residue levels present, but the focus was on antibiotics being used. These included certain antibiotics, which have been declared critically important to humans by the World Health Organization (WHO). Jaysimha, managing director of Humane Society International India, had complained to ASCI about the misrepresentation of CSE data. Meanwhile, the New Delhi-based think tank had objected to the ad twisting the data to suggest that there is no misuse of antibiotics in the poultry sector and that the chicken produced is safe. The ASCI has now given the AIPDSPL time till May 23 to modify or withdraw its claim.